Software-based music-making setups are now extremely popular, but even ardent DAW and plugin fans are starting to appreciate that adding a few bits of hardware into the mix can give your sound more colour and flavour. 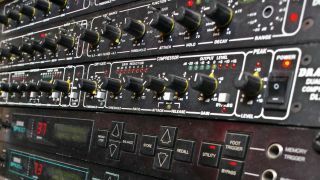 Here are nine tips for anyone who wants to get more out of their existing hardware processors or is considering starting a collection of outboard gear. For more on hardware processing, check out Future Music 284, which is on sale now. As technology advances, more and more interesting ways of processing audio become available. One of these is using your audio interface as a processor. Some high-end interfaces have included DSP for quite a while now. More recently, some manufacturers have made this available not just for treating inputs 'live', but also in the mix. The best example of this sort of hybrid system has to be the UAD Apollo. The Apollo allows users to use its internal DSP to load UAD plugins in the mix, and also to treat any incoming audio in real-time - and the real bonus is that there is no perceivable latency. Couple all this with best-in-class analogue emulation algorithms and you have something very close to using the real thing. If you are working on a budget and absolutely most have 'that sound', then this could be the most sensible route there is right now. Even if you don't spend a fortune here, you will be rewarded with total flexibility. You will be able to alter routings and free up inputs on your interface. Most hardware compressors add 'warmth' to your signal - usually some extra harmonics and a touch of saturation. You can push this to create more extreme effects. A compressor usually has an input gain or drive control; if not, you can push more level into it using the output control in your DAW. As things heat up, you'll notice heavier saturation, an increase in perceived volume and reduced dynamic range. This can be an awesome effect but, when using analogue and digital systems side by side, only overload the analogue end. Digital distortion is not great so, even in high-resolution systems, leave some headroom. This is pretty key - if you have spent a sizeable chunk of cash on a vintage tube compressor, it's well worth ensuring that your tubes are in good working order and that your meters are calibrated. It is possible to use your iPad or iPhone as an effects processor. There are plenty of great processors and synths for iOS. Most of them allow real-time control over their parameters via the touchscreen. For this alone it's worth the effort of setting your device up! You'll need an iOS-compatible interface to do this properly and Apple's Lightning Camera Kit cable. With these things in hand you should be able to hook your iPad up just like any other insert effects unit. Some apps then allow you to route the audio coming in and out of the iPad without any other help; for others you will need to use extra apps. If you fancy making things edgier, distortion and overdrive are your best options. When it comes to hardware processing, these effects are relatively easy to create: all you need to do is feed your compressor, EQ or limiter with a lot of gain. In most cases, an overloaded analogue circuit will produce some lovely creamy overdriven tones. You only want to drive the analogue portion of the signal path and not the digital. This will involve careful balancing of the levels leaving and entering your DAW. Pay special attention to the levels on your audio interface and ensure you have plenty of headroom. Some of this gear is big and gets very hot very fast. Make sure that the rack space you are using is adequate and has some decent ventilation. Consider saving some space between each device. If you like the direct interfacing that all digital devices bring to the party, then you might want to consider using these as part of your studio setup. SPDIF or ADAT interfacing will allow you to use the digital ports on your interface and no extra conversion will take place. This essentially gives you hardware-based DSP that will work just like a plug-in. Sometimes these hardware units contain effects that are hard to replicate in software and any work done in these boxes will remove some load from your DSP. Look for second-hand models on eBay - a bargain retro unit for a little extra flavour. Don't be shy - once you get your new gear in place, push it to the limit. Saturation, distortion and fuzzy harmonics are your friends. Let's be honest - this is why we love hardware!